If you have to create a graphical user interface it is a possibility to snap evey control to a fix location. Usually this is not a good idea, most of the time you have to write an event handler which adopts the locations and sizes of your controls. Here the idea of a layout manager takes place, a layout manager provides a solution for standard scenario. 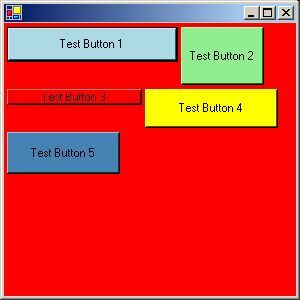 Because .NET (dotnet) only provides the possibility to dock and anchor a control, but no possibility to put controls in standardized grids or automaticaly resize every control proportional, I implemented this layout manager framework. 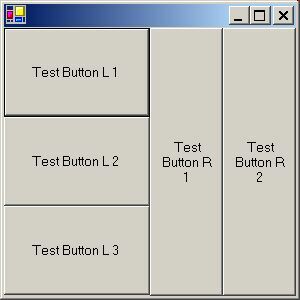 This framework consists of a layout control which is derived form System.Windows.Forms.Control. If you like to use this layout manager you have to use this control as container for your controls. In order to use a layout manager your first create an instance of that layout manager and than assign it (at creation time) to an instance of LayoutManager.LayoutControl. Now you can work with the Control in the familiar way. If you like to change the layout manager of an LayoutControl later on, you can do so via the "Manager" propery. 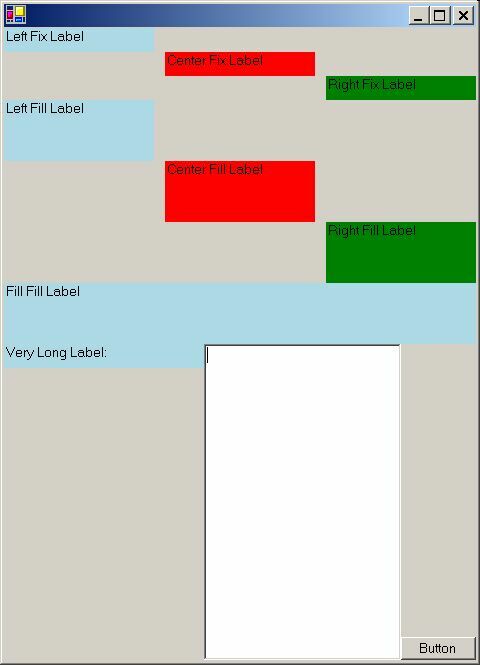 FlowLayout is a simple left to right and top to bottom layout. You can sort the controls either by insertion order (default; TabOrder = false) or by TabIndex (TabOrder = true). 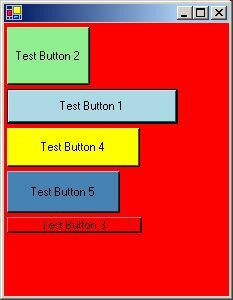 To use it you have to create a LayoutControl using a FlowLayout object. Then choose the size of the control. Now you can add controls as you like. If you alter the size of the control now, the position of the controls will be readjusted. RubberLayout is a simple proportional layout. To use it you have to create a LayoutControl using a RubberLayout object. Then choose the size of the control so that you can place your controls convenient. If you alter the size of the control now, the label myLabel will always stay in the upper left corner of the control (position [0, 0]) and occupy half (50/100) its width and a quater of its height (25/100). 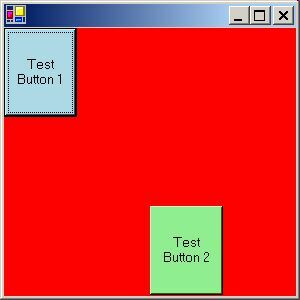 GridLayout works with a grid of equidimensional cells, which will be filled row by row. To add a control to a specific cell in the grid, just use the method GoTo(row, column), before adding the control. If you fill a cell more than once, only the last control will be in the cell. QLayout stands for queue/quick layout, because it lines up (queues) the given controls either in one row (horizontal mode) or column (vertical mode) always equally distributing the total amount of space between all controls. The controls will be added from left to right in horizontal mode or from top to bottom in vertical mode. If you need advanced features use the QConstrainedLayout. The QConstrainedLayout works like the QLayout but offers the possibility to define constrains (the alignment) for every control you add to the layout control. Use the method "SetAlign(Control, HAlign, VAlign);" to set the alignment. and "Top", "Center", "Bottom", "Left", "Right" and "Fill" in the unmanaged dimension. ILayoutManager.cs Interface of the layout manager. LayoutControl.cs Control which uses the layout managers. 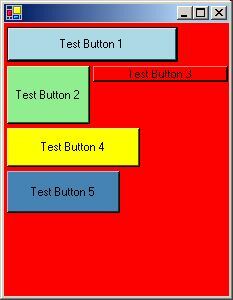 FlowLayout.cs Provides a simple left to right and top to bottom layout. RubberLayout.cs Provides a proportional layout, which means every control you add will keep its position and size relative to the parent LayoutControl	. 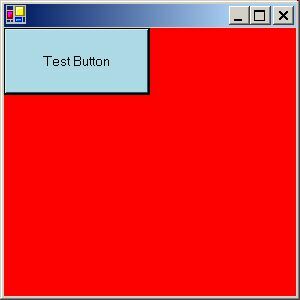 GridLayout.cs Provides a grid layout. Simply specify the rows and columns, then add your controls (the first control will be added in first column of the first row). The grid will be filled row by row. QLayout.cs QLayout stands for quick/queue layout. 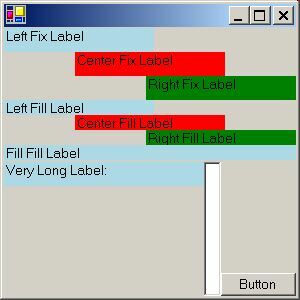 A layout which lines up (queue) the given controls, always distributing the available space equally between all controls. QConstrainedSpace.cs This layout works like the QLayout, with the additional possiblility to set constrains for the "queued" controls. QConstrainedSpace is a helper class to produce Controls, which can be used as spaces for the QConstrainedLayout. slm.zip This ZIP file contains all files you need, plus samples for every layout manager, plus a batch file to compile the layout manager and the samples.